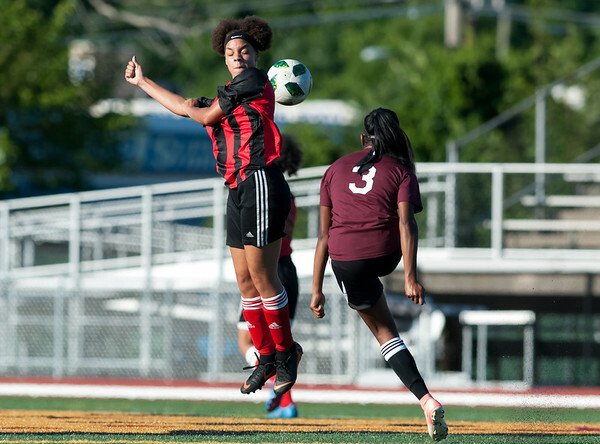 NEW BRITAIN - It turns out 70 minutes of play was not enough to determine a winner of the Elite Nation FC (New Britain)-Windsor match in the opening round of the Nutmeg State Games 18U girls soccer tournament. More time might not have even worked. The two teams managed just a combined seven shots on net on their way to a 0-0 draw at Veterans Stadium. Despite not coming out with a victory, New Britain head coach Zelvan Philips remained focused on the positives. The New Britain offense struggled to get anything going early, failing to put a shot on goal in the first half. They were able to put two shots on goal in the second half, but the team was noticeably putting more pressure on the Windsor defense. Mikayla Hayes was key in net for New Britain. She stopped all five shots on goal and picked her spots on when to come out of the net to go after the ball. It also somewhat helped that New Britain was able to maintain fresh legs with the team subbing in and out on nearly every stoppage. Typically, so much movement causes confusion, especially with a team with little playing time together. But Philips relied on his players’ ability to adjust on the fly. The draw gives New Britain its first point in the standings. The team still has two more round-robin games left before the medal rounds on Sunday. Its next game is today against the Avalanche (Southington) at Sage Park. But in order to make it to the medal games, Philips knows his team is going to have to produce on offense. Posted in New Britain Herald, New Britain on Thursday, 19 July 2018 21:21. Updated: Thursday, 19 July 2018 21:23.